Andrea Dovizioso (Ducati Team) took victory in a restarted race in Valencia. 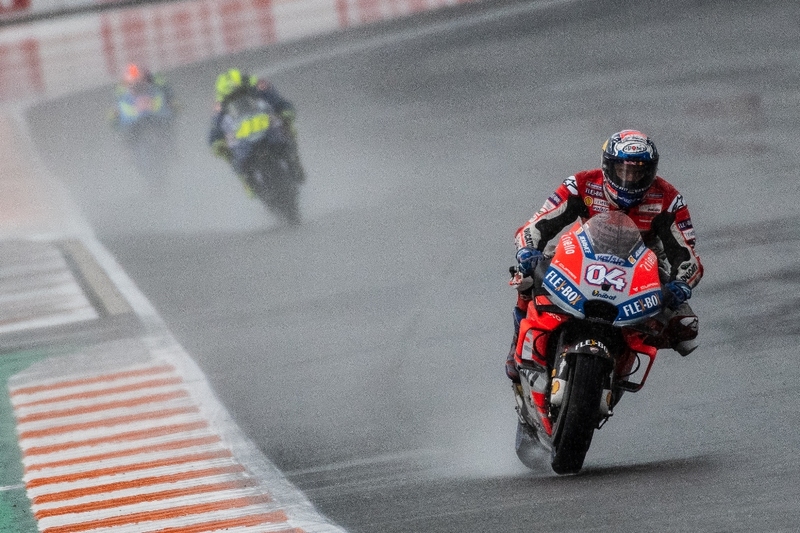 The weather at this weekend’s final race of the season had played a massive part in the proceedings, with heavy rain on Friday and Saturday giving the riders and teams no time to set-up for the dry conditions they faced in qualifying on Saturday. Torrential rain soaked the track for the first sessions of the weekend. In yesterday’s dry qualifying Maverick Viñales (Movistar Yamaha MotoGP) took Pole Position. As today’s race got underway Alex Rins (Team Suzuki ECSTAR) got the holeshot and led for the initial part of the race. 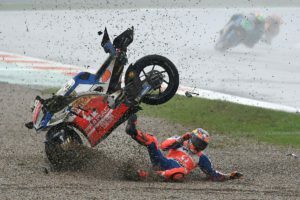 Then the rain started to fall very heavily and puddles appeared on the track, causing a number of riders to crash due to the conditions, a situation which forced the organisers to red flag the race for safety reasons. Following a short delay, the rain eased and drained from the 4,005m track and a 14-lap restart was announced with riders starting from the position they finished the first race. This gave Rins the first spot on the grid and he again capitalised by making the holeshot once again. Eventually, he took the chequered flag and set the fastest lap in the process. Rins took second, a result which gave him fifth in the championship and Suzuki’s fourth successive podium, the first time since 1994. Third went to Pol Espargaro (Red Bull KTM Factory Racing), securing the first top-three position of his career in MotoGP and the first podium for the Austrian manufacturer since it entered the class in 2017. 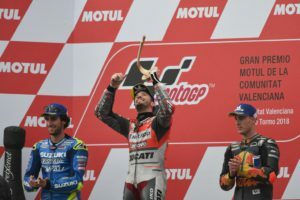 The podium of Ducati, Suzuki and KTM not only had three different manufacturers but was the first time since Misano 2007, that Honda or Yamaha had not taken one of the top three spots. 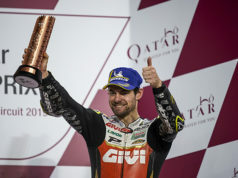 Michele Pirro (Ducati Team) took fourth, whilst the audience gave a special cheer to Dani Pedrosa (Repsol Honda Team). He crossed the line in fifth in his last ever race, on a weekend which also saw him inducted as a MotoGP Legend. 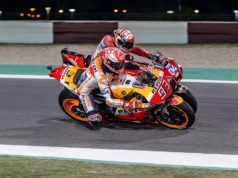 His points were also enough to secure the Team Championship for Repsol Honda, wrapping up a hat-trick for the Japanese marque after it had already taken the Rider and Constructor titles. Takaaki Nakagami (LCR Honda) recorded his best result of the season in sixth, which also gave him the honour of First Independent Rider for the first time in his career. Johann Zarco (Monster Yamaha Tech 3) came home in seventh, taking the Independent Rider title in the process in a race which was his last on a Yamaha before he moves to KTM. Bradley Smith (Red Bull KTM Factory Racing) also produced his best result of the year, in what was his last ride for the team, as he came home in eighth. To round out the championships, Franco Morbidelli (EG 0,0 Marc VDS) took the Rookie of the Year award, narrowly beating Syahrin and Alma Pramac Racing took the Independent Team title. Due to the very wet track, all riders began the restarted race with the soft compound option front and rear rain tyres, with only Rins opting for a medium front. In the first race there was more of a split between the front compounds, with everyone except Marc Marquez (Repsol Honda Team) choosing the medium rear. 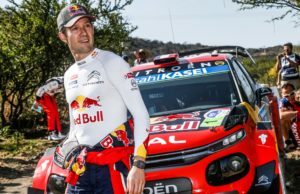 In the dry conditions the riders were able to make decisions as to what they would have used in a dry race. If the rain had kept away, five of the six compounds had been provisionally chosen by the field. Races don’t come much tougher than that one, as you can probably tell… ? Mercedes celebrate the title: One down, one to go!